Uptown Streetscape is a thing! On Monday, I had the great pleasure of speaking to Waterloo City Council on behalf of the region's Active Transportation Advisory Committee. In our last meeting, the committee endorsed the plan presented by the project consultants and city staff to revamp Uptown Waterloo's streetscape with wider sidewalks and protected bike lanes. I also had the pleasure of watching that plan passed unanimously. The plan was the product of multiple consultations and strong public feedback, which I wrote about previously here and here. I also helped get the word out about protected bike lanes on twitter, on CBC radio (sadly the clip is no longer available), and in blogs. Together with the efforts of a number of passionate individuals, including the inimitable Graham Roe (whose petition garnered a thousand signatures) and tireless Mike Boos (who designed the amazing infographic) we got Waterloo informed, and engaged. The people spoke, and the project team listened. The BIA got on board, and so did the politicians. What a journey! Considering that in 2010 I heard from one streetscape committee member about the very passionate arguments around the table about removing any traffic lanes at all, this points to a real evolution in thinking by many members of our community. There are still a few rough edges. While Waterloo has a plan to replace lost parking (the streetscape plan will cost 22 parking spaces, but the LRT construction will affect considerably more), this plan still needs to become a reality and businesses will need to see their customers continue to reach them, whether it's by foot, bike, or car. There is also the question of intersection design. 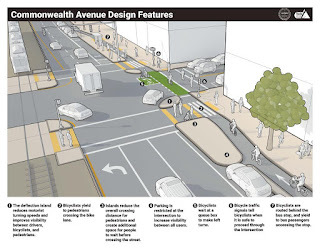 Protected bike lanes will interact with these intersections similarly to on-street bike lanes, in that they'll be alongside traffic lanes and clearly visible at intersection approaches. But there are other approaches we could take, including this adaptation of Dutch intersection design for Boston's Commonwealth Avenue. Or even better, we could take a step further and implement a "protected intersection". Just some thoughts on how to polish this plan to perfection. Man, it's been a while since my last post! I've been busy with the Active Transportation Advisory Committee, still working a little with TriTAG, but mostly taking care of real life. But the march of progress brings new lessons and observations. I have a few things to post about now, but I'll start with what is freshest on my mind. And that is: we're seeing new transit routes being created, and we're making some mistakes with transit stop spacing and placement. But there's confusion about why they're mistakes. Mistakes are being made because we're treating the entire region with the same standard, without considering that parts of our region, the cores, have more potential riders and potential destinations. Our system will benefit more from more closely spaced stops at strategic locations within these dense urban areas than from assuming one central stop can serve an entire core, or that one standard can serve an entire region. The new 204, and Queen St. Regional Council's Planning & Works committee heard from a few delegations on Tuesday about the upcoming GRT improvements. There are concerns about rationalizing existing routes with the introduction of a new iXpress route. 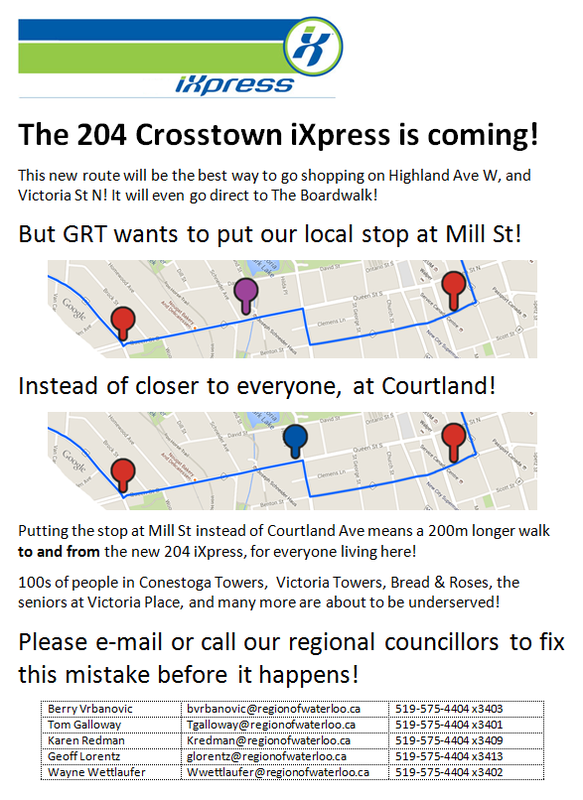 But there was also a vocal debate about that new 204 iXpress (travelling along Highland to Queen, through downtown, and out east along Victoria.) In particular, about its stop placement. A couple of residents of the Bread and Roses coop at Queen and Courtland took issue with the (apparent) stop placement at Queen and Mill, instead of what looked more logical to them, Queen and Courtland, where there are almost a thousand housing units just in the nearby major buildings alone. 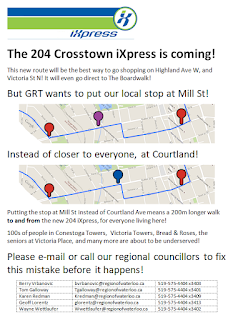 In fact, it got even messier when it was revealed that the "GRT stops" at Queen/Highland and Queen/Mill were actually both 1-way stops, separated by a few hundred metres, a situation which serves nobody well. In response, staff and some councillors argued that this area is well served by other routes and by the planned stop at Charles St. terminal. But that misses the point that the 204's potential is being undermined. First, let's talk about GRT's defined goals. GRT stops are defined to have a 450m effective radius, for calculating what parts of the city are covered by transit. ION LRT stops will have a larger effective radius, on the logic that people will walk further for better service. GRT's "iXpress" stops are also intended to have a larger spacing than regular routes, so that the buses can move faster. These standards are important because they give GRT and the region an objective measure they can use for planning, and some defense against the reality that quality of service is uneven, and changes will always make some people unhappy. GRT works very hard to make sure routes and stop placements are sensible. Coverage standard is not the only tool in their toolbox, but it's a big one. The problem is, it's only a tool, and it won't maximize the benefit or performance of transit. And being bombarded by people complaining about the removal, the moving, or even the placement of a route or a stop, planners are still missing important information amongst the noise. The 204 stop placement issue reveals this. An objectively strong argument is made for putting the stop here rather than there. Region staff and councillors seem ready to dig their heels in against this argument. What do they need to consider? Transit stop placement needs to consider the potential for trip generation. And this analysis is already being done. In the example above, there is clear potential for trip generation at Queen/Courtland, but the location is being discarded because it fails other tests: coverage overlap with the terminal, for one. Route overlap too, which is really coverage again because the coverage question isn't where do you want to go, but can you get to anywhere at all. Our downtown cores are big trip generators. Transit is most attractive when it stops close to a potential rider or their destination. Adding stops closer together within a downtown makes transit more attractive to a lot of people. A delegate made a strong point about the many current car users who live in the immediate vicinity of Queen and Courtland, and how strong transit presence and convenient stop placement in that location will have a big bottom-line effect on the region's efforts to increase the modal share of travel by transit. This point is so far unaddressed by Region staff, who largely see the location as sufficiently well served by transit without assessing the quality of that transit versus the trip generation potential of that location. Again, to satisfy the coverage goal, it doesn't matter where you can get to, or how frequently, as long as a bus going anywhere shows up nearby at some point. This is the reality for much of the region's suburban areas which are hard to serve with transit. It is a poor defense for a major urban node. If the region can provide quality, frequent, convenient iXpress transit service to a large number of current drivers and potential riders, the potential for ridership increase may outweigh the incremental impact of an additional stop. The potential for transit use within a downtown core, in particular Kitchener's quite substantial downtown, is being completely missed in this discussion. By assuming all transit users will gravitate to a central terminal, GRT is actually making it extremely difficult to cross from one end of our downtown core to the other. The effect of this is actually turning downtown edges into transit deserts. There's so much service at the terminal that routes, especially iXpresses, don't need to stop nearby. Except that those living on the outer edge of a dense downtown are presented with a long walk, despite the fact there is much more potential for transit use there than along most of the rest of the route. And if you want to get to the other side of downtown, you're out of luck. You could walk to the terminal, assuming you can find a bus that will stop near where you're going. Or you could try a local route that does stop frequently enough, but then pay a layover time penalty at the terminal. Or you could play transfer roulette. If the region wants to make more of our downtowns accessible by transit users, it needs to stop assuming "one big central point" is all a downtown needs. Despite LRT positioned as rapid transit with wide stop spacing, ION planners have, curiously, placed a higher stop frequency within the city cores of Waterloo and especially downtown Kitchener. Notably, they have added stops that its predecessor, 200 iXpress, does not have. In Uptown, a new Allen stop joins the Waterloo Town Square pair. In downtown Kitchener, we have Victoria, Young/Gaukel, Frederick/Benton, and Cedar where only Victoria and the Charles St. terminal exist as stops today. And Victoria was added to the 200 only recently. ION planners recognized the need to serve downtowns with multiple stops and to target destinations. Regional transit staff need to take a similar approach with iXpress. Density provides transit ridership through increased trip generation. Promixity to good transit service also drives ridership. Good transit service is partly driven by route speed, which is negatively affected by the number of stops along the route, so that is a major tradeoff. For most of its history, GRT has actually had too many stops on its routes, slowing down buses, raising costs and making its service less compelling. But in attempting to deal with this problem, the region wants to treat all places the same. Stop spacing over 1km apart makes for rapid buses through our suburbia, and is an acceptable tradeoff between service quality and availability. But stop spacing at this scale within an urban core doesn't just affect downtowners, but also the potential suburban users who may head there. We need to look at density when placing stops. We can't assume an entire downtown will be served at one central point, because there are so many potential riders who live on the edge of that dense core who transit will fail to attract, and also too many potential riders elsewhere who are destined for parts of downtown that are too far from that central point. Every stop slows down a route, obviously. And everyone wants a bus stop on their doorstep, with a rapid trip in between. Clearly you can't add stops everywhere. But does it make sense to treat a dense urban cluster of apartment buildings, with multiple seniors' residences and other attractions as a place with the same transit need as a suburban hinterland of single family homes on widing avenues? Can we afford to ignore the ridership potential of parts of our downtown cores presented with poor access to transit that runs right by their front doors? iXpress buses represent the bones of our new transit network as they link up with the ION spine. Like ION, they need to provide good cross-town service. Also like ION, they must serve the downtown cores well. Instead of simplistic coverage goals, we need a metric that will balance overall access to transit with high quality service for the most people and destinations. For iXpress, that may mean switching to a 500m stop spacing standard within the boundaries of Kitchener, Waterloo, and Cambridge cores. There's so much to do in these places, so many attractions, and a large and growing number of people. In these places, transit should be compelling and convenient. Remember, high density areas are high generators of both trip origins and destinations. Serve them well, and you'll get a lot more riders for your transit service dollar. There's an addendum here, if you're still reading this polemic. That 204 stop at Mill? The one that turned out to be a single-direction stop with the other 300m away? This is awful. Don't do this. Splitting stops is sometimes necessary, but always bad. Human Transit talks clearly about how split routes turn potentially useful transit into "symbolic transit", i.e. they look like good lines on a map but they don't serve anyone well. Split stops are just about as bad. Consider the situation of St. Mary's hospital. The 204, tragically, does not serve the hospital directly (something I urged planners to consider.) But that's OK, right? There's a 204 stop 400m away at Highland. Unless you're heading the other direction, in which case it's over 700m away. You're better off taking a different bus, or a taxi. Nobody wins with a split stop situation like this. Bad enough that it gave the impression of better coverage than was already there, an unfortunate communication gaff. It also gives the impression of useful service to a wide area, where in reality very few in the area will find the route useful. Only people who live between these two one-way stops will find them useful, and there just aren't as many of them. Certainly not as many as you'd find in around a sensible two-way stop location placed at a densely populated intersection.